RBNY News & Notes: Willkommen Herr Rost! Good afternoon! It's a glorious one here in Red Bulls Land. Not only that, but our glorious team is back in action @The Home Depot Center. Chivas USA will be the opponent and three points are a must for RBNY. But before all that, let's examine some RBNY news from the past week. 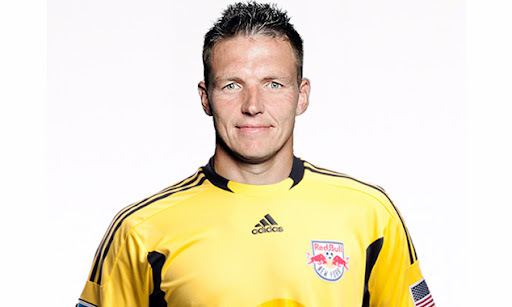 Of course, the big news of this past week was the signing of former Hamburger SV netminder Frank Rost. The big 6'4", 38 year old German has signed a Designated Player contract for the rest of the season, with a club option for next. Herr Rost arrived late Thursday night, participated in yesterday's training session, then declared himself happy to be here and ready to win a title. With his paperwork in order, Rost has been deemed ready to go and will, more than likely, start today @Chivas USA. Please click here for a first look at our new Teuton, whose signing has been deemed "The Big One" by RBNY GM Erik Soler. And speaking of RBNY goalkeepers, one of them was very absent from yesterday's training session - and it wasn't Bouna Coundoul. That's right, Greg Sutton wasn't in training yesterday and is rumored to be on his way to Montreal. So it seems that it will be the big Canadian who'll get the axe, while Bouna Time will retain his spot on the roster. Red Bulls forward Luke Rodgers will likely miss the next 3 to 4 weeks. Rodgers hasn't fully recovered from the plantar fasciitis that he's been suffering with for the last month. Another Red Bull, Designated Player center back Rafa Marquez, has been ruled out from participating at the MLS All-Star game. Rafa has been recovering from the hamstring injury he suffered while on Gold Cup duty with the Mexican National Team. Red Bulls Head Coach Hans Backe explained his fielding of an all reserve side @Chicago for last Tuesday's disappointing (and that's putting it mildly) US Open Cup loss to the Fire. It's official! Thierry Henry really, really hates turf fields. Former RBNY forward Jozy Altidore will make Holland the next stop of his European adventure. Former RBNY midfielder Tony Tchani will make Columbus the next stop of his MLS career. The Crew will be Big Tony's third team within a three month span. That's all for now. Will be back later on with a preview and predictions for today's massive away tilt. Viper Out!